Ananya Birla – a leading singer, songwriter, and entrepreneur is a big animal lover. After her smashing debut single Livin’ The Life, second superhit song Meant To Be, she has just released her third song. Hold On is a song inspired by people in relationships that have gone through adversity but held on to their love for one another. The audio released on 1st March and the video on 9th March. 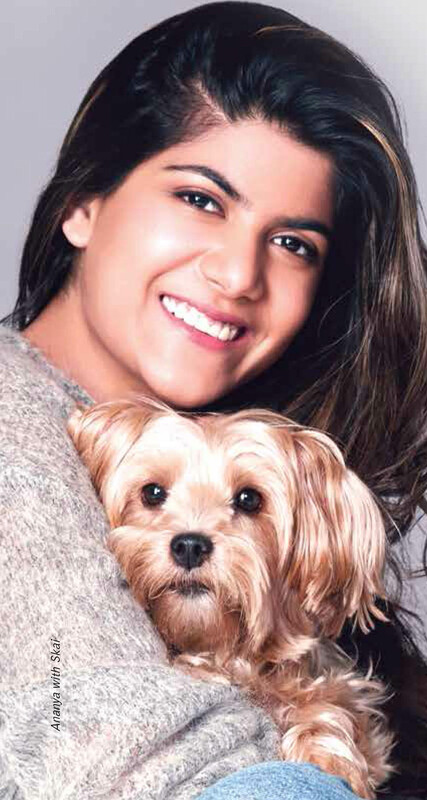 Here is a conversation with Ananya Birla about her beloved pets. Have you had pets throughout childhood? If so, who was your first pet? I love to have animals around the house. They bring so much joy and love and are very much members of the family. My first pet was Skai, a Yorkshire Terrier. As kids, my brother and I had always wanted a dog and one day our mother surprised us by bringing Einstein home. Einstein, a Labrador Retriever is one of the most special parts of my childhood. He is loyal, lovable, and always so happy. Over the years how many pets have you had? Just two – Einstein and Skai. Skai is my baby, she has been with me since my time at Oxford University. She brings so much happiness to my life. Has there been a favourite? That’s tough! I have immense love for them both, but I am particularly close to Skaii. I’ve seen her grow up and we’ve spent so much time together. She comes to my office on most days and she travels with me, indeed the best travel companion I’ve had. Any special incident you remember with your pets. I always wanted to have a Yorkshire Terrier, and I fell in love with Skai the minute we met. I often feel like she chose me instead of me choosing her! One of my friends from Oxford surprised me with two Yorkies. We named the male Yorkie Skai, and the female was named Ocean. she’s a female. By then I was too attached to her, so I decided to keep her with us anyway. Any special antics of your pets that you cherish? Skai is the funny one. With her, special antics happen daily. Whether it is waking me up when she gets bored so I can play with her, barking at herself looking in the mirror, or being a little overprotective of me and getting flustered if someone enters a room which we are in. How do you spend time with your pet? every morning and falls asleep next to my bed every night. She loves going for long walks or taking a trip to the pet shop to pick up some toys and treats (I tend to spoil her a little bit). She also really enjoys chilling next to me when I am listening to music or playing the guitar. What do you love most about your pet? day to be really helpful and I am always cheered up by how she rushes to the door to greet me. The strength of the bond a human can share with dog is huge. It’s like this amazing, unconditional love. What do you think your pet loves the most about you? her head out to feel the wind and to see and smell everything we drive past. She gets so excited. So many dogs get left alone for hours and hours every day, I think she really enjoys that she gets to travel and to come to work with me. Do you take your pets when you go on a vacation- if yes then where? Would you like to share any memorable experience with us? (where they keep the food) and started to bark. It was total chaos! Do you see to your pet’s exercise and nutrition needs? What is a special treat for your dog? The chew bones from all my travel. It is amazing how quickly she gets through them now. She is also obsessed with this toy that she has had for years, even though it is now totally in tatters she can’t move on. She loves half torn, her saliva-smelly toys! Any tip you would like to share on responsible pet parenting, grooming, feeding. Favourite activity together: Long drives with wind in our hair! Qualities you love: She is very protective and loving. She knows exactly how to cheer me up! Funny/Crazy antics: Sometimes I pretend to bark near her and she believes there is another dog in the house and just goes crazy running around everywhere. She also hates it when I play any kind of game and am ignoring her, when I play Fifa or cards she will run around the room and all over whatever I am doing to try and distract me.